Every set of safety eyewear on our site include high quality, optical quality 1 lenses. For more information on what this means see the Standards Advice section. Most of the glasses are however available in different lens types, each of which is especially designed for different light conditions. The clear lens is the most popular as it filters out 10% or less of the visible spectrum providing as near to natural vision as possible. They also filter out 100% of harmful UV light. For lens manufacturers this is difficult since the line between harmful invisible UV light and our visible spectrum is very small. The smoked lens is much the same as you will find in traditional sunglasses but with the added strength of EN166 certified impact resistance. They will block out up to 87% of visible light which may sound excessive but are required when working in normal bright outdoor conditions. The contrast lenses have a gradient of tint from dark at the top to clear at the bottom. These are now preferred by many that used to wear clear lenses as they protect from sun glare and lighting above but allow high clarity when working at eye level or below. On this site we sometimes refer to this lens as a Yellow or Light Enhancing lens. Technically it does not actually enhance the light but provides additional contrast and reduces glare, making it appear easier to see in low light circumstances. They are very popular when working on surfaces of a similar colour such as snow or on cloudy overcast days. During low light many surfaces can appear flat and the term ‘flat light’ ­is often used to describe this situation. This can often happen in the middle of an overcast day which make the yellow lens highly popular in the UK. This lens also has a few other important enhancements such as a partial Flash coating for reflection of Infrared / heat and also a 30% blue light filtration. Blue light is part of the visible spectrum but has been proven to cause partial and total blindness over time. Although this lens does provide 100% UV protection, they do improve visible light which means they are not ideal for use in bright sunlight which could force you to squint, resulting in a headache. Extra Sensory Perception (ESP) is the name given to a type of lens that cleverly filters out the harmful blue end of the spectrum. Blue light has a smaller wave length than the other visible colours and is closest to invisible UV light than any other. It carries more energy that others colours also which makes it damaging to our eyes in the long run. Blue light radiates between 380nm ± 480nm and these lenses remove this wavelength, allowing rest of the visible spectrum through. Safety glasses using these lenses are regarded as an excellent choice for people moving in and outdoors on a regular basis. These can be distinguished by their reflective appearance and as such have been very popular regardless of their special properties. Flash lenses are similar to smoked lens in that they filter out roughly 90% of visible light making them excellent for bright outdoor conditions. 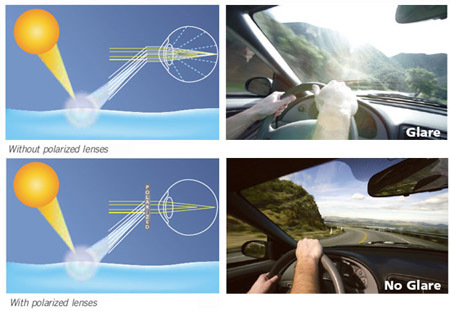 However, the special properties of this lens also filter out up to 60% of infrared radiation. Over time the heat carried by IR light can cause damage to the Cornea and since IR light is invisible, your eyes it will not adjust to increased exposure. Flash lenses are therefore an excellent choice for working in direct sunlight or an industrial process giving off high temperatures.